Lent is a great time to branch out into other cuisines that are naturally fast-friendly. One year during Great Lent, I belonged to a Facebook group of Orthodox believers from all over the world who shared recipes online. One of my friends in the group was the daughter of an Old Believer priest who was herself an expat living in New Delhi. She may have had the easiest time of any of us in following the fasting requirements. Indian food is full of vegan recipes that require no adjustment at all. Indian food may not rank with Italian and sushi in the lists of foreign cuisines that Russians love, but in Moscow today it’s not particularly difficult to find the ingredients for Indian dishes. Lentils are available practically everywhere and many spices can be found on grocery shelves, although for some things it’s necessary to go to a specialty shop. However, there are two shops that sell Indian spices and other ingredients less than a mile from my house in central Moscow. I love Indian food and would happily take advantage of the Lenten fast to cook as much of it as possible. Sadly, the other people who live in my house are not the biggest fans of curry. They do manage to tolerate curries that involve coconut milk, so, for today – a mild coconut curry that can be adjusted to satisfy those carnivores in your life. Heat oil in a large pan or wok. Add onion and sauté 2 minutes. Add garlic. Saute 30 seconds. Add tomato paste and all spices. Mix coconut milk with ½ cup water and add to pan, stirring until smooth. 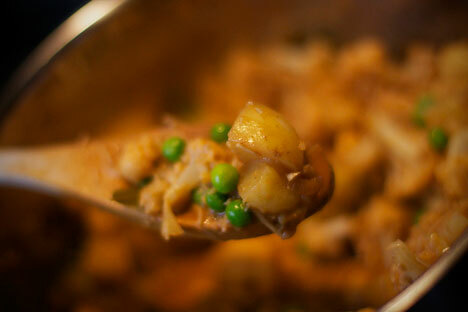 Add cauliflower, peas and potatoes. Reduce heat and simmer 20-30 minutes until vegetables are soft. Serve over rice. Other vegetables such as green beans and carrots can also be added along with the cauliflower, potatoes and peas. NOTE: For the non-vegetarians in your family, cut a couple of chicken breasts into cubes and sauté in 1 Tbsp oil until done. The chicken can be added into the bowls of those who want some meat with their curry. Read more: Lent - trial or long-awaited cleansing?